Thus begins the introduction to her book “poemcrazy”. Through a combination of personal stories and poems, Susan pulls you into her word world and invites you to begin making poems of your own. One of my favorite anecdotes centers on her seventh/eighth grade English class and her teacher, Mr. Mabie. She speaks of how his was the first class she ever had in school that allowed her to express the person she is instead of the “good girl I was supposed to be.” I only wish I would have had a similar experience so early on in my academic life! I have only begun to find that same sense of creative freedom now in my mid-forties. Wooldridge challenges the reader to begin collecting words. Words cost nothing. They are ours for the taking. They don’t have to be categorized when we’re collecting. They can be anything that pulls at our attention. Words come to us from an endless number of places. By collecting words in this manner, they can fall into a surprising phrase. At the end of many of the short chapters, she offers what she calls “Practice”. These prompts relate to the story shared in the chapter and are often accompanied by poems written by students in her workshops. I confess that I have not read this book from cover to cover. I pick up poemcrazy when I’m in need of an idea. I open the book to a random page and begin reading. I find new ideas every time, even on pages I’ve used before. 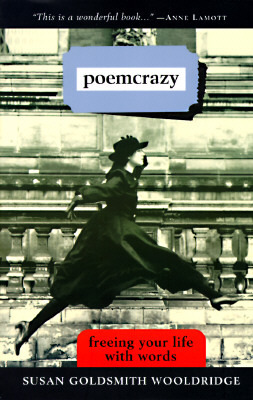 You can pick up a copy of poemcrazy at your favorite book outlet.